Home Income Tax IS IT COMPULSORY TO QUOTE DOCUMENT IDENTIFICATION NUMBER? 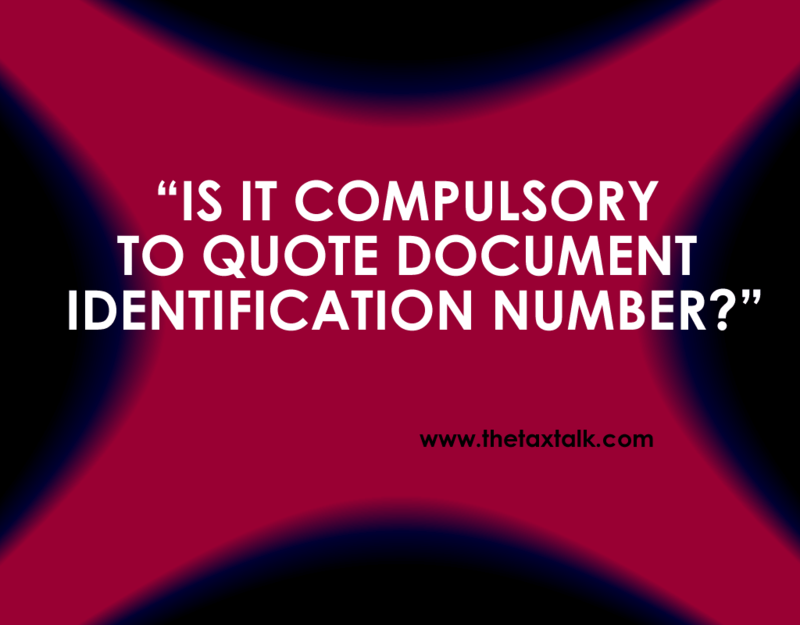 IS IT COMPULSORY TO QUOTE DOCUMENT IDENTIFICATION NUMBER? Is it compulsory to mention ‘Document Identification Number’ (DIN) in the Income Tax return for Assessment Year 2011-2012? Kindly enlighten me about the procedure for getting DIN? On Reorganization of share capital, company allots new shares in definite proportion to the old shares and for fractional shares, company sends cheque/draft in lieu of the same. How this amount of fractional share is treated in Income Tax. Can we assume that the Security Transaction Tax is deducted for claiming exemption under L.T.C gain? On transfer of equity shares through Stock Exchange, is it not compulsory to deduct Security Transaction Tax in all the shares traded through Stock Exchange. Regarding Interest on cumulative term deposit with banks, referring C.B.D.T circular, you have suggested for accounting the interest on accrual basis, though the accounting system is followed on receipt basis. Is it compulsory to account the interest on accrual basis? There is no need to mention Document Identification Number (DIN) on the Income Tax Return. Originally, the Provision related to the Document Identification Number (DIN) was made applicable from 01.10.2009. Subsequently, its applicability was extended w.e.f. 01.07.2011. Lateron, considering the practical difficulties due to non availability of requisite infrastructure on an all India basis, the provision has been omitted by the Finance Act-2011 w.e.f 01.04.2011. (a) The difference between the cost of acquisition (Indexed cost be taken if shares are held for a period of more than 12 months) & the amount received, as related to fractional shares, would be taxable as LTCG u/s 112 @ 20%. The difference between the cost of acquisition & the amount received, related to fractional shares, would be taxable as Short Term Capital Gain if the shares are held for a period of not more than 12 Months & it will be treated as your regular income for tax purpose. (b) If, however, the transactions pertains to listed shares & held by you for a period of more than 12 months, the difference between the cost of acquisition (without indexation) & the amount received, as related to fractional shares, could be offered for taxation @ 10% if it is less than the amount computed in (a) above. It cannot be presumed that Securities Transaction Tax (STT) is deducted at the time of payment of the amount of the Fractional Shares. Also, there is no liability on the payment by the company in such cases. Whenever the transaction (purchase or sell) is done through recognized stock exchange, the incidence of Securities Transaction Tax arises. It is attracted at the time of purchase & at the time of sale also. CBDT circular suggests following mercantile system specifically in respect of recognizing Interest on Term Deposits with Banks. However, CBDT circular is not binding on the Assessee. The LTCG on shares is proposed to be taxed in the new Direct Tax Code. However, the final law of DTC, the date of Applicability, etc has not yet been released. We will try to cover the implications of DTC in due course of time. The payment of the Flat under construction has been made by me from the sale proceeds of the house but the sale agreement is jointly in the name of me and my son. Whether LTCG exemption can be availed even if the Flat is in the joint name or it should be in my name only? Exemption u/s 54 would be admissible even in respect of flat purchase in the joint name. Ensure that your share & investment in the house property is more than the Long Term Capital Gain (LTCG) arising on transfer of the old Gandhidham House. The name of your son can be included in the new flat purchase for the convenience. If the house property in respect of which exemption u/s 54 is claimed is transferred. Within a period of 3 years of its acquisition, the amount of exemption given earlier would be taken back. So, if you transfer the newly acquired flat within a period of 3 years to anybody, the exemption allowed earlier would be taken back. It may be noted that the exemption u/s 54 against long term capital gain. Is admissible if the LTCG is invested. For purchase of a residential house property within 2 years from the date of LTCG. Ensure the compliance with the time frame for valid exemption.